CHICAGO--(BUSINESS WIRE)-- Today, Hyatt Place Los Cabos in Baja California Sur, Mexico reopens in Los Cabos after suffering extensive damage following last year’s passage of Hurricane Odile. The hotel underwent a $7.6 million reconstruction, including a redesigned lobby and new terrace with unobstructed views of the ocean. Hyatt Place Los Cabos is owned by a joint venture between affiliates of Hyatt Hotels Corporation (NYSE: H) and Grupo Hermosillo. The hotel brings the Hyatt Place brand’s modern conveniences and stylish design to the Mexican market. Hyatt Place Los Cabos is conveniently located on Paseo Malecón, just 20 minutes from the Los Cabos International Airport. Steps away from the beach on the Sea of Cortez, the hotel is also near the Jack Nicklaus designed 18-hole “Club Campestre” Golf Course, the San Jose del Cabo Historic Center and Art District, and the signature arch at Lands End, Cabo San Lucas. Guests to the destination may also enjoy seasonal water activities, including whale watching, surfing, kayaking, sailing, wave runners, jet skiing, and deep-sea fishing among others. For Hyatt Place Los Cabos information in English and Spanish, or to make a reservation, visit www.loscabos.place.hyatt.com. Launched in 2006, the Hyatt Place brand delivers authentic hospitality by combining style, innovation and convenience to create a perfectly seamless stay with every modern comfort guests deserve. Inspired by the 24/7 lifestyle of multitasking travelers, Hyatt Place hotels feature spacious guestrooms with the Cozy Corner sofa-sleeper, free Wi-Fi everywhere, 24/7 Gallery Menu, Coffee to Cocktails Bar, and the a.m. Kitchen Skillet™, a free hot breakfast for guests. The Odds & Ends program also has guests covered with items they may have forgotten and can buy, borrow or enjoy for free. Specially trained Gallery Hosts are on hand to offer assistance with everything from directions to check-in to a freshly made meal. 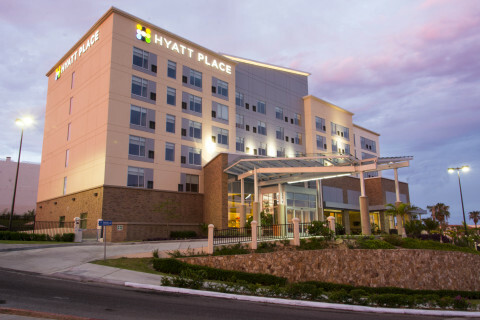 Hyatt Place, a brand of Hyatt Hotels Corporation, offers more than 220 locations in the United States, Armenia, Chile, China, Costa Rica, India, Mexico, Morocco, Panama, Puerto Rico, The Netherlands, and United Arab Emirates. For Hyatt Place information or to make a reservation, call 1-888-HYATT-HP (888-492-8847) or visit hyattplace.com. Hyatt Hotels Corporation, headquartered in Chicago, is a leading global hospitality company with a proud heritage of making guests feel more than welcome. Thousands of members of the Hyatt family strive to make a difference in the lives of the guests they encounter every day by providing authentic hospitality. The Company's subsidiaries develop, own, operate, manage, franchise, license or provide services to hotels, resorts, branded residences and vacation ownership properties, including under the Hyatt®, Park Hyatt®, Andaz®, Grand Hyatt®, Hyatt Centric™, Hyatt Regency®, Hyatt Place®, Hyatt House®, Hyatt Zilara™, Hyatt Ziva™, Hyatt Residences® and Hyatt Residence Club® brand names and have locations on six continents. As of March 31, 2015, the Company's worldwide portfolio consisted of 599 properties in 50 countries. For more information, please visit www.hyatt.com.